It’s pear season and although pears aren’t one of the fruits that I usually buy, I’ve been reading up on French cuisine and notice they have a lot of fruit-based desserts (baked apples, poached pears, etc). Most recipes specify Bosc pears and I wanted to find out why. Is it because they taste different compared to other pears? Or is it because they have a different texture? Anjou: Green in color, firm, refreshing and and light tasting. There wasn’t that much flavour in this one compared to some of the other ones but it did have a nice refreshing taste to it. 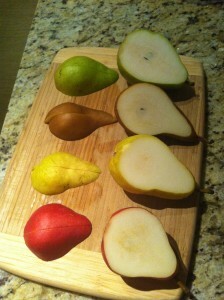 Bosc : This narrower-shaped pear has a tan skin and was the sweetest compared to the others. 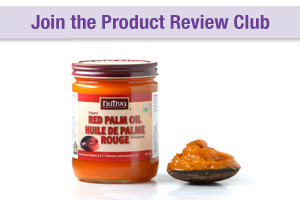 It has a firmer texture which is probably why it’s recommended for baking (it will hold up well when baked or cooked). Bartlett: This pear had the distinct flavour that I recognize whenever I eat canned pears. It has a strong flavour (which give me the impression that the canned pears I bought were probably Bartletts). 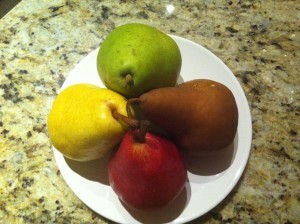 Red: This pear had a pretty red skin but tasted bland and was the least flavourful out of the bunch. I’m feeling pretty good about trying to become more aware about seasonal produce. Pears are in season right now but sitting next to the pears were a bunch of pineapples on sale for $1.88 (and I’m pretty sure pineapples aren’t in season just yet). Another thing that I learned during this experiment is that pears contain even more fibre than apples (which makes sense since they have a grainier texture). Apples on average have 2.6 g of fibre, whereas pears have a whopping 4 g! That’s quite a significant difference as far as fruits go. Just to put this into context, you may see some breakfast cereals or foods that say “High source of fibre”. 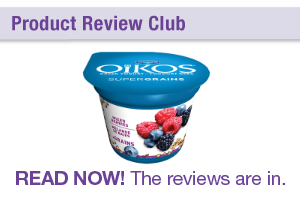 This means it contains at least 4 g of fibre per serving (the phrase “high source of fibre” is government regulated). So having said that, switching things up in the morning and grabbing a pear as you’re heading out the door might not be a bad way to go (especially on those days when you might not have time to eat a bowl of cereal). Having said that, the next time I do a pear taste test, I’ll make a point to just try half of each pear and eat the rest throughout the day or use it up for a dessert the day after. At 4 g of fibre each, having four pears in one sitting generally isn’t a good idea unless your body’s used to it.